Most AutoCAD functions are a result of values loaded from settings files and registry keys. Resetting the program to defaults will restore the program to its original settings. Each user account on a system will have its own AutoCAD settings. Resetting to defaults will only affect the currently active user account. To reset in a different account, you must first log in to that user. 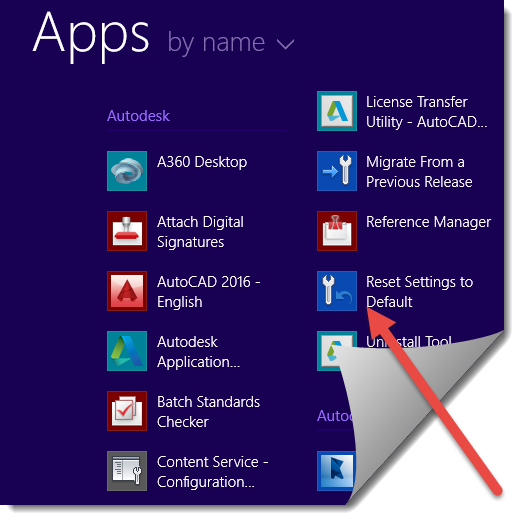 Start menu ==> All Programs ==> Autodesk => AutoCAD 201x => Reset Settings To Default. 1. Click the Windows button to access the Start Screen. 2. Right-click the bottom of the screen. 3. Click the down arrow to access all the installed apps. 4. In the AutoCAD section, click Reset Settings to Default. In the AutoCAD section, click "Reset Settings to Default." Click the Window menu and choose Reset Palettes or enter RESETPALETTES on the command line. 1. Click Preferences under the AutoCAD menu. 2. Click the Application tab. 3. Click the button Reset Application Options. Click the Windows button to access the Start menu. Click the down arrow v to expand 'Autodesk'. Scroll down and click on 'Reset 201x Settings To Default'.